Would you like to go to Los Angeles this June to compete in the DOLE California Cook-Off event! 1.Review and follow the Official Rules. 2.Create a delicious, healthy entrée recipe using DOLE Canned Fruit or Juice and up to 7 additional ingredients (spices, herbs, water and cooking spray are not included in the total, see Official Rules for details). 3.Submit my original recipe in the text box provided on this page. Be sure to click on the submit button to enter your recipe. (We suggest that you create your recipe on a separate document first, and then copy and paste it into the text box). Enter up to 3 unique recipes a day for your chance to WIN! 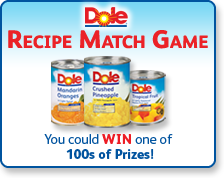 Plus you can play the DOLE Recipe Match Game for your chance to win one of 100s of prizes. Hurry, contest ends April 30, 2010. Go to DOLE SUBMIT YOUR RECIPE FOR A CHANCE TO WIN A CALIFORNIA GETAWAY! From home cook to celebrity chef! Five lucky finalists will win more than just their 15 minutes of fame with a trip for two to sunny LA where they will participate in the California Cook-Off event with celebrity chef Ben Ford. With airfare, three nights' accommodations, a rental car and spending money included, you'll be living your very own California dream! Just visit www.DoleCookOff.com to enter your signature recipe for an entrée that highlights at least one can of DOLE Fruit or Juice. Using DOLE Pineapple, Mandarin Oranges, Tropical Fruit, Pineapple Juice or Pineapple Mango Juice, as well as no more than seven additional ingredients, you will be automatically entered to win this ultimate California cooking experience. The California Cook-Off event will be held at the Epicurean School of Culinary Arts, one of the most well-respected culinary schools in California. You will be teamed up with a professional blogger as your "sous" chef, who will chronicle the cooking process and feature your dish on their site! This blogger will be on hand to help with your dish and share the experience with you with their readers. Plus the Grand Prize winning recipe will appear on cans of DOLE Fruit nationwide! Don't forget to keep coming back to www.DoleCookOff.com for more chances to enter your favorite recipes, as well as discover great new recipes to try out! And tell your friends! For each friend you tell about the DOLE Cook-Off, you'll get an additional entry to win! 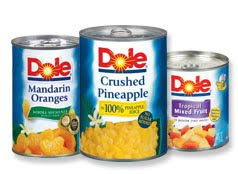 DOLE Canned Fruit comes in three different varieties: Mandarin Oranges, Pineapple and Tropical Fruit. Convenient and ready-to-eat, DOLE Canned Fruit is the one of the best ways to have fruit always on hand in your pantry. DOLE Canned Fruit is naturally fat free, saturated fat free, cholesterol free, and rich in vitamin C.
DOLE Canned Fruit has been awarded the ChefsBest award by the American Culinary ChefsBest. DOLE Canned Pineapple is a convenient, ready-to-eat product. For your convenience, DOLE Canned Pineapple is available in slices, chunks, tidbits and crushed. DOLE Tropical Fruit is a combination of hand-selected pineapple and red and yellow papaya chunks packed in light syrup and passion fruit juice. DOLE 100% Pineapple Juice and Pineapple Mango Juice are packed with real fruit taste and always have the flavor adventure you've been craving. Disclosure: I received a coupon for a free can of DOLE fruit. No compensation was received for this informational post.